Berlin Investment, the company behind the Face of Black Secret make up brand toured the country to scout for a lady to become the next face of their product and also to become the lead campaigner on cervical cancer. After several months of auditions, 13 beautiful ladies were picked to battle each other for the above, which included a crown, a car and cash. At the end of the final event, Sandra Kubapire Awampaga beat the other young ladies to win the ultimate. Sandra Awampaga becomes the third Face of Black Secret which first commenced in 2010. 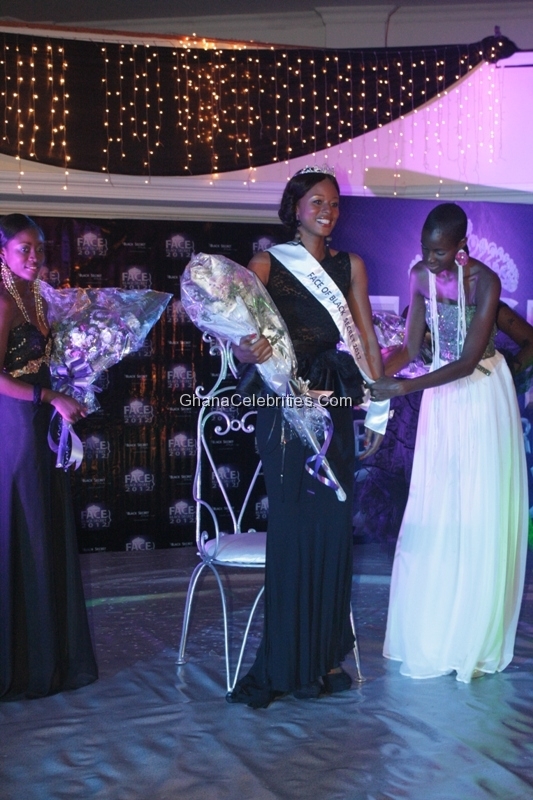 Gloria and Akosua picked the first and second runner up respectively. As the ‘Face of Black Secret’ 2012, Sandra will be creating awareness and lead the campaign on Cervical Cancer. According to statistics, Ghana has a population of 6.7million women age 15 years and older who are at risk of developing Cervical Cancer. Current estimates indicate that every year 3,038 women are diagnosed with cervical cancer and 2,006 die from the disease. Cervical cancer ranks as the 1st most frequent cancer among women in Ghana, and the 1st most frequent cancer among women between 15 and 44 years of age. With the above staggering statistics, Sandra would be tasked to help in encouraging and educating women to seek early treatment. Sandra picked a Kia Picanto Car worth GHC 3.000.00 in addition to other prizes. The first and second runner-up [second and third positions] took home GHC 1.500.00 and GHC 1.000 plus hampers from the sponsors. Other contestants also went home with hampers. Now how many beauty pageant are there in GH?!?! Selina & Naa Anorkor To Represent Ashanti Region For Face Of Black Secret 2012! Face Of Black Secret 2012 Auditions Date Announced! Photos: Face Of Black Secret 2011: Selassie Anku!